The Book of Mormon is the centerpiece of Joseph Smith's documentary record. It served to Smith's followers as a witness of his divine mission and as a foundation of their newfound faith. 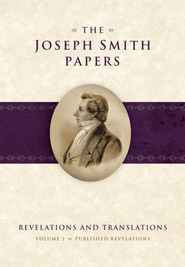 This volume, the third in the Revelations and Translations series of The Joseph Smith Papers, gives readers unprecedented access to an early Book of Mormon manuscript through full-color photographs, a color-coded transcript, introductions, and reference material. From early April to late June 1829, Joseph Smith dictated the majority of the text of the Book of Mormon. He and other believers explained that Smith translated the Book of Mormon from writings on ancient metal plates to which he had been led by a heavenly messenger. Smith's translation of the plates was not the conventional process of converting text from one language to another through expert knowledge of both languages—instead, he recounted that he dictated the text "by the gift and power of God." With the aid of "interpreters" he found buried with the plates and a seer stone already in his possession, Joseph Smith dictated the text to Oliver Cowdery and several other scribes. The manuscript they created is known as the original manuscript. Because of significant water damage suffered in the nineteenth century, less than 30 percent of the original manuscript has survived. Most of it is held by the Church History Library of The Church of Jesus Christ of Latter-day Saints, Salt Lake City. After the original manuscript was completed and Joseph Smith had secured the services of a printer, Smith directed that a second copy, now known as the printer's manuscript, be created. This would allow the original manuscript to be kept safe while the second copy was taken to the print shop. Oliver Cowdery, Hyrum Smith, and a third, unknown scribe created the printer's manuscript from roughly August 1829 to January 1830, and pages of it were taken in batches to E. B. Grandin's print shop in Palmyra, New York, as printing proceeded. The first edition of the Book of Mormon went on sale in Palmyra on March 26, 1830, and Smith formally organized a church less than two weeks later. The printer's manuscript was consulted again by Joseph Smith and others when the second edition of the Book of Mormon was printed in 1837 in Kirtland, Ohio. The manuscript was eventually obtained by the Reorganized Church of Jesus Christ of Latter Day Saints (now Community of Christ), headquartered in Independence, Missouri, and it is reproduced here with their generous permission. The carefully preserved manuscript is virtually complete—only three lines of text are missing. This volume of The Joseph Smith Papers provides a facsimile edition of the printer's manuscript of the Book of Mormon. Because of the length of the printer's manuscript, this volume has been split into two parts: Part 1 contains introductory and explanatory materials, the copyright and preface pages of the printer's manuscript, and the text of the Book of Mormon from 1 Nephi through Alma 35. Part 2 contains the text of the Book of Mormon from Alma 36 through Moroni 10, statements of Book of Mormon witnesses, and reference material, including a chronology, a biographical register, and a table documenting how the printer's manuscript was used in printing the 1830 and 1837 editions of the Book of Mormon. While the volume and document introductions in Part 1 place the printer's manuscript in its historical context, the annotation throughout the volume focuses strictly on textual issues, including identifying significant variants between the printer's manuscript, the original manuscript, and early printed editions. Readers wishing to study the full text will need to consult both Part 1 and Part 2. Designed for those who wish to carefully research the early text of the Book of Mormon and efforts to that book, the transcript in this volume reproduces the printer's manuscript exactly as it appears today. The transcript preserves corrections and revisions of any kind, line and page breaks, and even the locations of interlinear insertions. Since several scribes penned revisions in this manuscript, the handwriting of each is rendered in a different color to facilitate analysis. The photographs included her—the first complete photographic of the printer's manuscript ever published—allow comparison with the transcript and provide details that can never be fully captured in transcription. Royal Skousen is a professor of linguistics at Brigham Young University and editor of the Book of Mormon Critical Text Project.